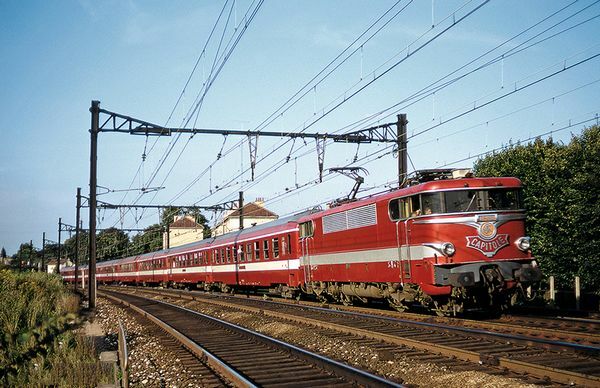 Prototype: 2 type A9 express train passenger cars, 1st class, and 1 type A7Dd express train passenger car, 1st class with a baggage compartment, painted and lettered for the French State Railways. In the elegant, ruby red paint scheme of the "Le Capitole" express train. Model: The cars have a close coupler mechanism. An interior lighting kit can be installed in the cars later. The car set has special book-style packaging for a stylish presentation, including placeholders for the 16691 locomotive to go with the set and the add-on car set, item number 15951. All of the cars have the lettering "Le Capitole" on the sides. Total length over the buffers 306 mm / 12-1/16".